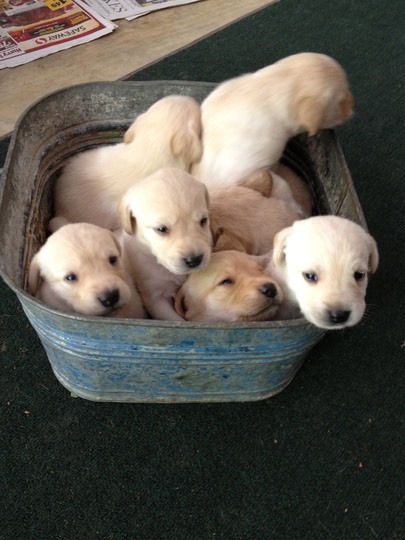 Prairie Plains offers puppies for sale from a select breeding schedule throughout the year. We strive to produce healthy, conformationally sound puppies with championship traits that are reproduced from a carefully studied pedigreed breeding program. We want to reproduce the best traits from our AKC/UKC Championship Males and our AKC/UKC Championship Females. We strive for puppies that are eager to please and are instinctively birdy as defining of the Labrador breed and display the best qualities of each of their parents. We carefully consider the male and female temperaments, willingness to obey commands, the instinctive determination/drive and conformation of the best attributes of each dog before pairing for breeding. Our male and females are certified hip healthy and also blood DNA certified to be genetically clear of any inherited Labrador Retriever known diseases. Our animals are provided a high protein, high fat content food as well as vet recommended supplements for optimal health and lean muscle mass. At Prairie Plains we breed for ability and temperament first and foremost. We train and title our breeding stock so therefore we know the quality and traits of each individual dog. The dogs used for breeding at Prairie Plains British Labradors and Kennel are hip certified, elbow evaluated and tested for hereditary genetic diseases. We have had great success in our breedings and are continuously complimented by our clients. Prairie Plains British Labs come with full registration with AKC and microchipped. This means that owners of Prairie Plains puppies can breed their dogs and register that litter with AKC.